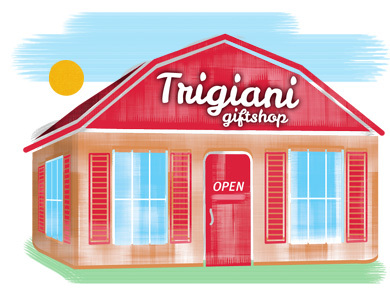 Welcome to the Trigiani Giftshop. The novels of Adriana Trigiani inspire the products here. When we were children growing up in Big Stone Gap our mother, Ida, had a giftshop. She stocked it with beautiful things she and Dad found in their travels. We all worked in the shop while in high school and I guess it stuck with me. As I read Adri's novels I imagine them coming to life. I'm sure you all do. So the products here are a beginning - the beginning of my attempt to bring the people and places of her novels to "life". There are many more things to come. Enjoy! I hope these products bring you all the good feelings that Adri's novels do. Special Note: if you are ordering from outside the United States please contact us first at contactus@trigianigiftshop.com. Should you have any questions about the products or an order or you have a thought you would like to share, please contact us at: contactus@trigianigiftshop.com. For information about Adriana, her books, her tour dates and appearances, Adriana Trigiani Tours or you're a book club looking to reach Adriana, please go to adrianatrigiani.com. Our policy is to provide complete satisfaction to our customers. We strive to make sure our customers are satisfied with the products they purchase and the service in which we provide those goods. If at any time you are unsatisfied or have a complaint, reach customer service at cs@trigianigiftshop.com. Also, we welcome any comments or suggestions that will make your experience more enjoyable. We look forward to hearing from you and responding to you. Thanks for shopping with us! Come back often as we will be adding new products on a regular basis! I've always lived by the old adage "Give credit where credit is due." Most of us don't do everything alone (really do any of us?) we always have help. This is where I want to give proper credit for the help I've received. Alvin joined me early in 2011 as I was starting work with some students from the University of New Haven. He jumped in and started putting together the site you see today. And his designing doesn't stop with websites. He's a terrific designer, a patient man and now a great friend. CJ moved to New York in 2010 to pursue her dream as a photographer. I have known CJ since she was a baby; our families were and are the best of friends. She started photographing the products when she arrived and I haven't let her stop since. She is amazing, has a great eye that makes everything appealing! And she is a consummate professional! These young women worked on designs for future products that are very exciting. They dove into the books and pulled from the pages ideas that are beautiful. I also learned so much from watching them work, great patience and diligence. I expect we will all see amazing things from them! Allen created the logo for ToniCo. We talked at some length about my vision for the company and where my inspirations were coming from and viola! 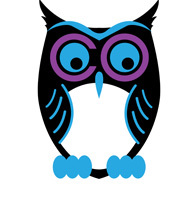 I got the owl! His eye for color is wonderful and there is never a detail too small to request. If that's not enough – he's a fantastic photographer as well! This young man has a brilliant future ahead of him! ToniCo was created as a vehicle for my imagination. My desire is to create things that are beautiful, functional, have a purpose and are affordable. Since beauty is in the eye of the beholder I hope our eyes meet! I find beauty in colors, textures and shapes. If something is not functional then what's the point? Why carry a bag that doesn't hold anything? Or wear a t-shirt that's ill fitting? You get what I mean. And of course if something's functional then it has a purpose. A tote bag totes, an apron protects, a necklace makes you smile (and the quotes make you laugh! ), and I could go on and on. My last desire – and to me possibly the most important – is that I keep things affordable. That's only fair to you. It seems like a natural step to begin with my sister Adri's novels. But that's only a beginning. There's much more to come.